It’s starting to feel very wintery up here in Shetland. The nights are drawing in and it’s getting really cold. I’ve been getting back into knitting and have been trying to use up the left over wool from my last two projects to make hats. I am also really getting into a bit of drawing and painting again. Anyway back to the sewing chat. You may have seen my blog post at the end of October where I announced the launch of my first sewing pattern for sale on Etsy, the Dora Dress and Top. I was so excited to put it online and finally share what I have been working on. Thank you so much to those of you who left me lovely comments on here and on social media. I was so nervous to put it out into the wild, so I really appreciated the support :). I have quite a few more Dora dress and top samples to share with you, so lets kick off today with my favourite version, the silver Dora Dress. I used this awesome silver pleated fabric from Stoff and Stil. I was so excited to try working with this fabric as I had never seen anything like it. I really wanted to create a statement piece that would showcase this pattern. Working with this fabric was odd, it was quite strange to cut as it has a 3D structure. I personally found the best way to deal with it was to stretch it out flat for the bodice pieces before cutting, which was a bit of a risky move, but seems to have payed off. Then for the skirt I just lightly held the pattern pieces against the fabric (not stretching it out this time) and cut them out with my rotary cutter. The best thing about this fabric is it doesn’t fray so I didn’t have to finish seams or hem, which was a treat! I did fully line this version in black cotton voile to make it comfy to wear, I worried the fabric might cling to my body otherwise. The pattern calls for a lined bodice only, but it is really easy to do a fully lined version. I basically just made another dress in the lining fabric and sewed the two together along the neckline, understitching to keep the lining from rolling out and making sure to hem the lining to be slightly shorter than the dress version. I love my silver Dora Dress. I think in this fabric it will make a great Christmas or New Years Eve party dress. Have you started making a party dress for the winter festivities yet? Stand on pins, sometimes they go in really deep and you have to pull them out while trying not to cry…glamourous. Bore their friends and family by talking about sewing. That glazed eye look that comes over people who don’t sew, as soon as you get into your full sewing-chat flow. Cry with frustration over a dud garment or sewing mistake. Spend all their money on fabric and patterns some of which you will probably never get around to using, but will just enjoy looking at. Make a mess. Some days (most days) your sewing room will look like a bomb has gone off in a lint bin. Become obsessed with Instagram. Partner: For gods sake go to sleep what are you doing on your phone? You: yeh yeh I’m finished *turns down screen brightness and continues to scroll surreptitiously under the covers* (those bloggers new makes aren’t going to like themselves). See flaws in their handmade garments that no one else can and point them all out to anyone who compliments you on a handmade garment you are wearing. 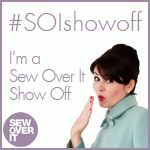 Speak in sewing jargon that only dedicated sewing blog readers will understand. For example: WIP (work in progress), UFO (unfinished object), not to mention all the pattern names we all know and love. Become bored of shopping for clothes and you will not believe that something finally brought your shopping habit to a halt. Although you’ve probably just substituted clothes shopping for fabric shopping, but sshh lets feel smug for a little while longer. I went to my friend’s hen party a couple of weekends ago and the theme was colours or countries. I was at a loss as to what to wear, I’m usually a bit rubbish at dressing up, but then I realised I can sew and decided to make myself something fun. The first thing that came to mind was a flag dress (Geri Halliwell at the brits style) but it’s been so overdone. I then had the idea of a world map dress so I could be ALL the countries. I googled world map fabric and found this on eBay Most of the world map fabrics I found were more suited to upholstery projects and the one I chose was still rather thick, but I thought it would be fine as long as I chose a pattern which would work with a stiffer fabric with very little drape. I used my block to draft this pattern a few months ago, made myself a dress which I am still yet to blog, and left it lying under my cutting table. I now have no idea why i abandoned this pattern as I love it. The design is quite simple, a fitted bodice with a half-circle skirt, but it is so flattering and I am now a complete convert to circle skirts, I love the way they fall so nicely and are simple to draft. I added side seam pockets to the skirt forgetting that the zip was to be in the side seam, so that was a bit silly, but I managed to make it work. Next time I would definitely add a seam allowance to the centre back and place the zip there instead. The bodice is lined with the same fabric and all the seams were finished with my overlocker. I have been really busy lately, with various projects, so this was a bit of a rush job. I didn’t spend time worrying about pattern placement as I really didn’t expect to ever wear it again, other than for fancy dress, but it turns out I actually really like it and might get more wear out of it than I first thought. I think I will make a few more of these for myself for summer, the length is perfect for casual or formal wear and I might even make one in my silk from India, which I think I have mentioned a few times. I have been hoarding it for so long and still haven’t been brave enough to use it. What do you think? Should this dress be relegated to the fancy dress wardrobe or is it nice enough to wear day to day? I think I mentioned a while back that I have been having a go at designing some of my own patterns. I attended a pattern cutting class at the London College of Fashion last year and on returning home drafted my own block with the help of a very useful pattern cutting book (Your Pattern Cutting by E.Sheila MacEwan). Since then I have designed a few trial patterns, some of which are still in progress. I made this dress a few months ago and it was one of the first patterns I drafted. The dress is very simple, so was an easy first design project. I got my inspiration from a RTW smock I owned for years, which recently wore out at the armpits and was unfortunately too far gone to repair. I love oversized relaxed garments that are comfortable to wear lounging around the house, but still look reasonably smart for wearing out in public, so that was what I was aiming for. The first version of this didn’t have the contrasting neckline piece. It was far lower cut and the neckline was finished with bias binding, but it wasn’t working as the neckline was a tad too low. I left it in a drawer for a couple of months and then the other day ripped back the neckline and finished it with this contrasting denim neckline insert, raising the neckline back up to a more modest level and adding an interesting design feature. I am really pleased with it now and think it’s far more wearable like this. I think I will get a lot of wear out of this. It feels so exciting to make your own designs, I really love the process and it’s great to have creative control over what you wear. Aaron and I took the photos this morning down at the Lodberries in Lerwick. It was a beautiful but breezy day so not the easiest weather to try and photograph a floaty dress, but we got a few good snaps. Just a quick one today. 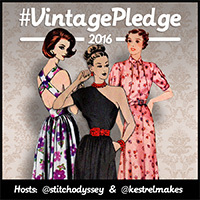 I am really excited to read that sign up has begun for Vintage Pledge 2016. I really enjoyed taking part last year. I managed to achieve my modest aim to try my first vintage pattern in 2015, if you didn’t see my 2015 vintage pledge make before you can find it here. This year I would like to up my Vintage Pledge game a little by tying a couple more patterns. In 2016 I, Elie of attieanddora.com, pledge to sew at least 3 of the vintage patterns in my stash. I don’t have a huge vintage pattern stash, but I dug out a couple for inspiration today. This first pattern is so 80’s and I’m surprised at myself for liking it, as I don’t usually like 80’s fashion much, but there is something about this style. I think it could look pretty cool in a crisp cotton lawn, I love a good shirt dress. This second one was a gift and I’m not sure if it’s vintage, vintage reproduction? It is 60’s I reckon, which is one of my favourite eras in fashion. Anyway, I love this pattern. I’m not entirely sure where I would wear it, but I could even bypass the outfit for now and possibly have a go at making the accessories. I might get some faux fur and try and make that hat or scarf. What do you think of my initial choices? 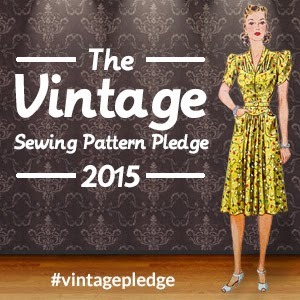 Can’t wait to get started now and to see all the vintage pledge makes! I bought the pattern, Hudson Pant by True Bias, a while ago with the intention of sewing myself a few pairs of comfy house trousers. Sadly, my sewing machine had been playing up when sewing with knit fabric, skipping stitches etc, and so it took me a while to get round to sewing these up. I am so glad I did, as I LOVE this pattern. The shape is so flattering, which is hard to achieve with jogging bottoms. I previously owned some RTW ones of a similar style and they were so saggy around the bottom, they made me look like I was wearing old man style PJs…. which wasn’t a great look. These on the other hand, make me feel awesome and have been immediately upgraded from “house trousers” to day wear! The fabric I used was a beautifully soft teal ponte from Sew Over It. I was planning a black pair, but I am glad I was a bit more adventurous with the colour as I love them. Construction wise, I cut out the size that best fit my hip measurement, it was too big in the waist, but that isn’t a problem as when you insert the elastic into the waistband you can adjust the waist size as you need. I am 5’11” so I added 3 inches to the length of the trousers, as they were drafted for a person of average height. I followed the instructions and used my overlocker for most of the seams, I think I used my standard sewing machine for attaching the pockets and the ankle bands, but the rest was on the overlocker. When it came to the waistband I went a bit rogue and decided against sewing the channels for a drawstring. I wanted this first pair to be versatile and wasn’t really going for a “sporty” look. I was worried they would fall down without the drawstring, but I pulled the elastic quite tight, to avoid this. The other problem with missing out the drawstring is that the elastic is prone to twist and fold inside the waistband channel, so I did hand stitch it to the inner side of the waistband to prevent this. The stitches are practically invisible as I got such a good thread colour match, but I am not sure how it will hold up, so I may still zig zag around the waistband as advised later. This pattern will no doubt be getting a lot more use as I’ve already had requests from family members for pairs and my boyfriend is keen for me to buy the men’s version of the pattern so he can have a pair too. So clearly a big hit.